Melbourne researchers are to begin a major study that could result in a test to accurately predict if women will experience preterm labour during their pregnancy. Such a laboratory or bed-side product would enable clinicians to offer suitable, potentially life-saving care to mothers and babies. The three-year trial study involving more than 3000 women at the Royal Women’s Hospital and the Mercy Hospital for Women will go ahead thanks to a commercial agreement between the University of Melbourne and Carmentix Australia Pty Ltd.
Royal Women’s Hospital and University of Melbourne senior research fellow Dr Harry Georgiou said bringing a preterm labour test to market would revolutionise maternity care. Mercy Hospital for Women and University of Melbourne researcher and obstetrician Dr Megan Di Quinzio said: “The vast majority of women are healthy and have no identified risk factors, but up to 10 per cent can experience labour at a preterm gestation without warning. Women planning to give birth at either the Royal Women’s Hospital or the Mercy Hospital for Women in Melbourne, are invited to take part in the Predicting Preterm Labour study - or PPeTaL. Swabs from participants will be analysed for protein “biomarkers” to check how closely those biomarkers are associated with impending labour. “Participation in this study could ultimately save babies’ lives in the future,” Dr Di Quinzio said. The University of Melbourne-Carmentix collaboration has already identified biomarkers associated with labour. The new agreement, announced today, will zero in on the most promising of those biomarkers to determine their predictive utility. Briony Swart experienced two miscarriages at 21 weeks. 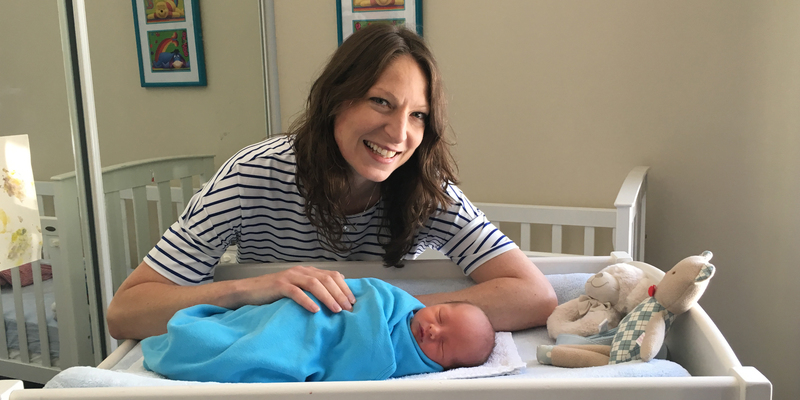 After close monitoring at the Women's Preterm Labour Clinic, Briony gave birth last week at term to baby Ziggy. She hopes a test to identify those at risk of preterm labour will help women like her in future. Women at risk of pre-eclampsia are being advised to take low-dose aspirin to reduce their risk of developing the condition. It comes as new research at the Women’s finds that low-dose aspirin in the laboratory, changes the way placental cells function, correcting the production of proteins that are associated with pre-eclampsia.